McDermot Avenue and Bannatyne Avenue provide important east-west connections between Waterfront Drive and Sherbrook Street. This project will improve the existing painted bike lanes by building one-way protected bike lanes, using adjustable bike lane curbs, on McDermot Avenue and Bannatyne Avenue in 2018. View the recommended design under the documents tab. Visit new bike infrastructure – a users guide to review new road features included in the project. Construction of the West Alexander to East Exchange bike lanes has started and is progressing quickly. Stage 1 construction is expected to be completed by June 22, and work on sections Stages 2 and 3 has also started. The next steps of work on Stage 1 will include adding signs, green paint, pavement markings, and traffic signals. We thank you for your patience as we continue with this work to ensure that the bike lanes are safe for everyone. Stage 1 will include construction of the adjustable protected bike lanes on McDermot Avenue and Bannatyne Avenue between Adelaide Street and Main Street, and back-in angled parking on Adelaide Street between William Avenue and McDermot Avenue. Stage 2 will include construction of the adjustable protected bike lanes and back-in angled parking on McDermot Avenue and Bannatyne Avenue between Main Street and Waterfront Drive. Stage 3 will include construction of the adjustable protected bike lanes on McDermot Avenue and Bannatyne Avenue between Furby Street and Adelaide Street, all works on Ellen Street between Bannatyne Avenue and McDermot Avenue, and all works on Hargrave Street between Bannatyne Avenue and McDermot Avenue. The project is expected to take approximately 12 weeks to complete. For further details please see the May construction notice. Construction notices related to work in the project area will be posted here prior to construction. If you have questions or want to receive construction notices via email please contact Kevin Rae at AECOM Canada Ltd. 204-928-8430. Throughout late 2017 the project team met with adjacent property owners to help optimize the space. View the recommended design. We are working to balance the needs of all users. Within the design, you will notice that in some constrained locations the buffer between the bike lanes and motor vehicle lanes has been reduced or removed to balance the needs of all users. Within the recommended design, you will also notice some changes to parking. The City understands that parking is important to businesses and residents. With this in mind, we are adding parking within the area to offset the loss of some parking spots along the corridor. View a map of the parking along the corridor and for more information on where parking will be added. The Pedestrian and Cycling Strategies identify the West Alexander to East Exchange Corridor as a high priority for upgrading to protected bike lanes. The City has been engaging the public to receive input on what is important to consider when developing a plan. Based on public feedback and technical analysis the recommended design for the West Alexander to East Exchange Corridor is Option 1 (view all three options used for public feedback under the documents tab), which includes one-way protected bike lanes on both McDermot Avenue and Bannatyne Avenue between Waterfront Drive and Furby Street. View the recommended design. Further information on feedback provided by citizens throughout this study is available in the public engagement report available under the documents tab. The project also includes designing a connection to downtown using Ellen/Carlton Street and Hargrave Street. The recommended design includes one-way protected bike lanes on each of Ellen/Carlton Street and Hargrave Street. In 2018, bike lanes will be constructed on Ellen Street and Hargrave between McDermot Avenue and Bannatyne Avenue only. Construction of the remaining parts of this connection will be considered for future construction seasons. The three options used during the public engagement process were evaluated based on a number of criteria to understand the benefits and impacts on all road users. The evaluation criteria were developed after engaging with stakeholders to gather information about what is important to those who live, work and spend time in the project area. Public participants identified a number of important considerations including bicycle network connectivity, safety, bicycle comfort, pedestrian comfort, transit reliability and comfort, impacts to motor vehicle traffic, impacts to parking, maintenance and snow removal considerations, and public input. Of these, safety, bicycle network connections, and cycling comfort were identified as most important. Ranked highest based on public input in terms of safety, network connections, and cycling comfort. Ranked highest based on technical analysis in terms of bicycle network connections, safety and comfort. Given the length of these streets and the magnitude of costs for permanent implementation, the protected bike lanes will be built using adjustable bike lane curbs. This adjustable infrastructure will allow for on-going monitoring and public feedback of protected bike lanes that will inform the design of the permanent infrastructure to be constructed at the time of the future street renewal. If you would like to provide feedback on the use of adjustable curbs in Winnipeg, please contact adjustablebikelanes@winnipeg.ca or 311. The project team sought public input through a variety of online and in-person activities in 2017. Phase 1 gathered information about key project values and objectives, current uses, and safety. This information was used to support functional design options developed in Phase 2. An online survey was available from June 8 – 30, 2017 with a total 243 completed submissions. Over 500 people tried out the pop-up protected bike lanes or discussed improvements with the project team. An online survey and mapping tool were available from February 1 to 21 with a total of 316 completed submissions. 3:30 p.m. to 5:30 p.m. at Boon Burger Cafe, 141 Bannatyne Ave.
We had over 440 interactions to discuss the improvements to bike lanes on McDermot Avenue and Bannatyne Avenue and gather information about what is important to those who live, work, and spend time in the project area. In 2015, City Council approved the Winnipeg Pedestrian and Cycling Strategies, which provides a long-range policy framework for active modes of transportation for the next 20 years. In September 2015, the City of Winnipeg initiated a public engagement process to receive input on the Downtown Bike Lane System and the West Alexander Pedestrian and Cycling Corridor. Feedback received during this process has been incorporated into preferred design options, which include a two-way protected bike lane on Garry Street through the Downtown Bike Lane System and Street Improvements project and a two-way protected bike lane on McDermot Avenue between Arlington Street and Furby Street through the West Alexander Pedestrian and Cycling Corridor project. These projects are being built over the next couple of years. For more information on these projects please see the Downtown Bike Lane System and Street Improvements web page and the West Alexander Pedestrian and Cycling Corridor web page. 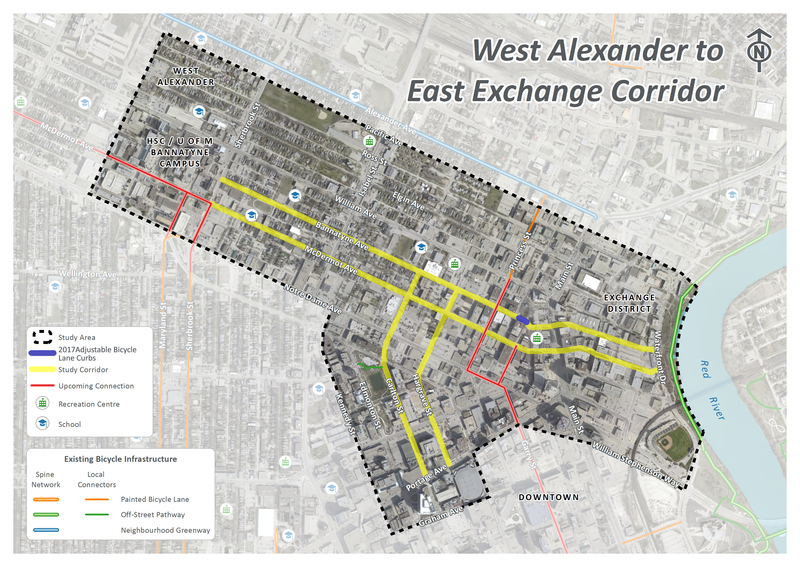 In January 2017, a public engagement process was initiated to receive input on the West Alexander to East Exchange corridor to continue the east-west pedestrian and cycling connection to the Exchange and Downtown. This project is a high priority in the Pedestrian and Cycling Strategies and will improve travel choices and connectivity to the Exchange District, Downtown, Health Sciences Centre, University of Manitoba Bannatyne Campus, and neighbourhoods surrounding Sherbrook Street. View the recommended design. Given the length of these streets and the magnitude of costs for permanent implementation the protected bike lanes will be built using adjustable bike lane curbs. This adjustable infrastructure will allow for on-going monitoring and public feedback of protected bike lanes that will inform the design of the permanent infrastructure to be constructed at the time of the future street renewal. If you would like to provide feedback on the use of adjustable curbs in Winnipeg, please contact adjustablebikelanes@winnipeg.ca or 311. Are the bike lanes meant to be wide enough for two cyclists? The bike lanes are one-way and allow for one lane of cyclists to move along the corridor. The curb-to-curb widths of McDermot Avenue and Bannatyne Avenue differ throughout the corridor. In order to provide consistent vehicle lane widths and alignment, the widths of the protected bike lane and buffer must change from block to block to make up this difference. This allows room for cyclists to pass in some sections, as well providing space for storing snow in the winter. Why is there a gap in the protected bike lane on McDermot Avenue, between Main Street and Albert Street? This has been done to accommodate the bus stop. Given the width of the road, a floating bus stop, which would have allowed for the bike lane to be continually protected, could not be built at that location. Why are there no protected bike lanes on McDermot Avenue and Bannatyne Avenue between Rorie Street and Waterfront Drive? 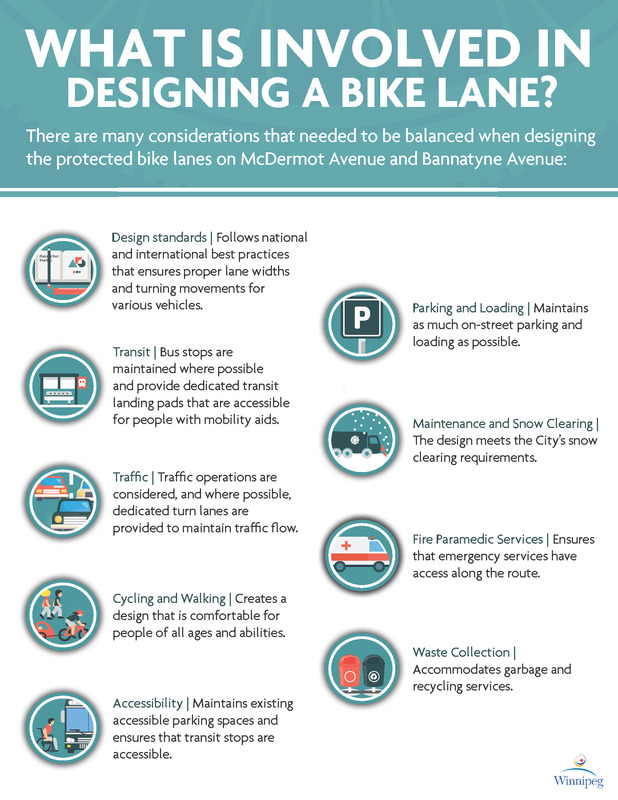 There are many considerations that needed to be balanced when designing bike lanes on McDermot Avenue and Bannatyne Avenue. Through stakeholder engagement we heard that on-street parking was very important to be maintained in the area. To accommodate the addition of back-in angled parking on these blocks there was not enough space to install protected bike lanes. Why are there gaps in parking on Bannatyne Avenue between Furby Street and Isabel Street? These gaps have been left intentionally to ensure that Fire Paramedic Service has access all along the street. Why is there no protected bike lane on Bannatyne Avenue between Adelaide Street and Princess Street? To accommodate the truck loading on this block we were not able to install protected bike lanes. Why do only some sections of Bannatyne Avenue, between Rorie Street and Main Street, have protected bike lanes? The sections of the street without protected bike lanes are to accommodate the summer patio and bus stop. During the summer the bike lane will be protected next to the patio with planters. Why do the widths of the protected bike lane and buffer change along the corridors? The curb-to-curb widths of McDermot Avenue and Bannatyne Avenue differ throughout the corridor. In order to provide consistent vehicle lane widths and alignment, the widths of the protected bike lane and buffer must change from block to block to make up this difference, with minimum widths of 2.0m and 0.3m respectively. Why was McDermot Avenue/Bannatyne Avenue considered? The City's Pedestrian and Cycling Strategies have prioritized McDermot Avenue/Bannatyne Avenue as an important connection into the downtown Winnipeg area. This study was approved by Council and is part of the 2016 Pedestrian and Cycling Action Plan. The design will maintain as much on-street parking and loading as possible. The City understands that parking is important to businesses and residents. With this in mind, we are adding parking within the area in order to offset the loss of some parking spots along the corridor. One option that is currently being explored is to add additional back-in, angled parking spots on nearby streets. This would build off of the back-in, angled parking currently taking place on Bannatyne Avenue near Waterfront Drive (by adding back-in, angled parking on a small section of Bannatyne Avenue, the parking capacity was increased by 10 spots). View a map of parking along the corridor and for more information on where we will be adding parking opportunities. 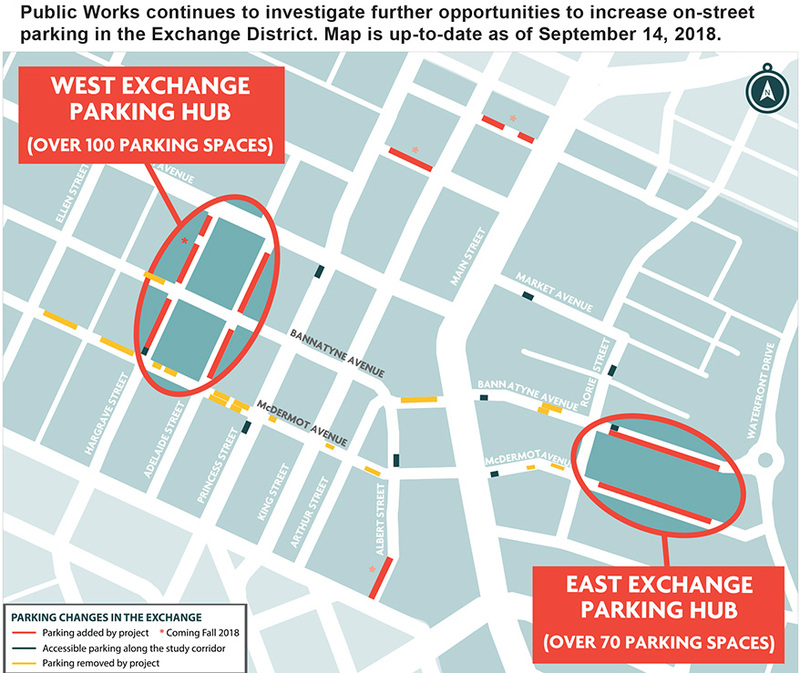 Is angled parking in the Exchange being considered to help increase parking opportunities? As part of the study we will be considering multiple options to determine how parking can be maximized. Will vehicular access to private property and businesses be limited by new pedestrian and cycling infrastructure? Private access would not be closed as a result of this project unless requested by the landowner. In the event vehicles are required to cross a protected cycling lane, signage and surface treatments would promote awareness for both cyclists and vehicles. Winter lasts about half of the year, so why are we building bike lanes? The City’s Pedestrian and Cycling Strategies commits to providing and maintaining safe walking and cycling infrastructure year-round. Will new cycling lanes connect with existing cycling routes and destinations? Upgraded cycling routes on McDermot Avenue and Bannatyne Avenue will ensure enhanced connections to existing and future planned infrastructure such as the West Alexander pedestrian and cycling corridor, the Arlington Street/Bridge connection, Downtown Bike Lane System, as well as future studies. When will permanent facilities on McDermot Avenue/Bannatyne Avenue be constructed? Given the length of these streets and the anticipated magnitude of costs for permanent implementation, it is anticipated that bike infrastructure upgrades would have to be implemented in conjunction with street renewal programs over the course of several construction seasons. Currently there is no such funding in place. The project is looking at adjustable bike lanes as a solution that can be implemented in the shorter-term. What are adjustable protected bike lanes? Adjustable protected bike lanes are bike lanes that are physically separated from lanes of traffic and pedestrian infrastructure using a variety of options. The layout and installation can be easily modified based on actual performance and on-going public engagement. The implementation can be done reasonably quickly and is cost-effective. How will the bike lanes be maintained during the winter months? Bike lanes will be winter maintained based on the current Council approved Snow Policy. Are there plans to remove the adjustable curbs during the winter? The curbs are permanent, but their specific location is adjustable to optimize the site. They will not be removed during the winter. How will on-going monitoring and public feedback inform or change the bike lane design? The City continues to collect public feedback on adjustable curbs through email submission to adjustablebikelanes@winnipeg.ca or through citizen contact with 311. The transportation division will monitor the new infrastructure on a continual basis through quarterly inspections as the seasons change. The use of both public feedback and technical analysis will be used to inform the design of the permanent infrastructure to be constructed at the time of the future street renewal. The City continues to collect public feedback on adjustable curbs through email submission to adjustablebikelanes@winnipeg.ca or through citizen contact with 311. Join our email list to be notified about upcoming engagement activities, look at the "Engage" tab on this website, and follow the City of Winnipeg on Facebook and Twitter .